Multinucleated giant cells due to an infection. H&E stain. 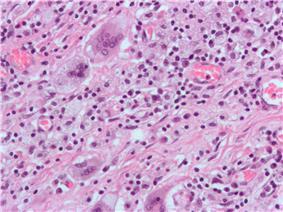 A giant cell is a mass formed by the union of several distinct cells (usually macrophages), often forming a granuloma. It can arise in response to an infection, such as from tuberculosis, herpes, or HIV, or foreign body. These multinucleate giant cells also known as (MGCs) are cells of monocyte or macrophage lineage fused together. Multinucleated giant cell formations can arise from numerous types of bacteria, diseases, and cell formations. Giant cells are known to develop when infections are also present. They were first noticed as early as the middle of the last century, but still it is not fully understood why these reactions occur. In the process of giant cell formation, monocytes or macrophages fuse together, which could cause multiple problems for the immune system. The most common form of giant cell formations is giant-cell arteritis, it is also known as temporal arteritis or cranial arteritis. This type of arteritis causes the arteries in the head, neck, and arm area to swell to abnormal sizes. Although this disease has no apparent causes it seems to be related to polymyalgia rheumatica. This disease is mostly known to affect older individuals that are in their fifties and sixties. Women are three times more likely to develop the disease than men are and Caucasians are seven times more likely to develop the disease than Africans. Symptoms are very similar to the flu virus and is often mistaken to be the flu virus. In the worst-case scenario, if left untreated, this disease can result in permanent blindness. The gold standard for diagnosis is a temporal artery biopsy. Before the biopsy to take place the skin in your face will need to be anesthetised for the incision. After numbing, an incision will be made in the face around the area of the temples to get a sample of the temporal artery. The incision will then be sutured. A histopathologist will then examine the sample under a microscope, who will then issue a pathology report (pending extra tests that may be requested by the pathologist). The management regime consists primarily of systemic corticosteroids (e.g. prednisolone), commencing at a high dose. This particular form of giant cell was named after a German pathologist, Theodor Langhans. Like many of the other kinds of giant cell formations, the epithelioid macrophages fuse together, and in return multiple nuclei form. This formation is often referred to as multinucleate giant cells in which the nuclei form a circle or semicircle related to the shape of a horseshoe away from the center of the cell. Langhans giant cell is said to be related to tuberculosis and it occurs in many types of granulomatous diseases. It is more common to get the disease if you are infected with tuberculosis in endemic areas or develop sarcoidosis. Langhans giant cell could be closely related to tuberculosis, syphilis, sarcodosis and deep fungal infections. Langhans giant cell occurs frequently in delayed hypersensitivity. This type of giant cell could be caused by a bacteria that spread from person to person through the air. Tuberculosis is related to HIV, many people who have HIV also have a hard time fighting off diseases and sicknesses. Many tests may be performed to treat other related diseases to obtain the correct diagnosis for Langhans giant cell. This type of giant cell also is sometimes called a xanthelasmatic giant cell. Touton giant cells also consist of fused epithelioid macrophages and have multiple nuclei. The nuclei form a ring and are surrounded by foamy cytoplasm, one symptom of this particular giant cell is a foamy cytoplasm making the cytoplasm visible around the nucleus. This giant cell formation has been seen in lipid-laden or more known fat necrosis. The formation of Touton giant cell is most common in men and women age 37 through 78. As the name implies, foreign-body giant cells form when a subject is exposed to a foreign substance. Exogenous substances include talc or sutures. As with other types of giant cells, epithelioid macrophages fusing together causes these giant cells to form and grow. In this form of giant cell, the nuclei are arranged in an overlapping manner. This giant cell is often found in tissue because of medical devices, prostheses, and biomaterials. Endogenous substances such as keratin, fat, and cholesterol crystals (cholesteatoma) can induce mast cell formation. Foreign-body giant cells in the lung. H&E stain. Foreign-body giant cell reaction to a suture. H&E stain. CD68 immunostaining demonstrating giant cells and macrophages.